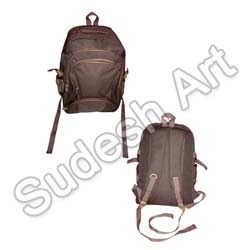 With the expertise of our team of professionals, we are instrumental in offering a high quality array of Stylish Backpack Bags in the market. Our range of bags is stitched by a team of creative professionals, using top-notch quality material. We procure the raw material for manufacturing our range of products from some of the reliable vendors of the industry. Being a client centric organization, we, Sudesh Art & Crafts Pvt. Ltd., are involved in manufacturing, supplying, exporting and trading premium quality Ladies Apparels, Dog Accessories, Cushion Covers and Leather Products. Our range comprises of Hippie Bags, Together Tote Bags, Fashion Belts, Embroidered Cushion Covers, Dog Leather Collars, Dog Winter Coats, Jogging Leash, Pet Jewellery and many more to name in the catalog. All our products are manufactured by the experts, in compliance with the norms and standards already laid by the industry. Our professionals use modern machines and quality approved material sourced from the certified vendors of the market, in order to manufacture these products. Before the end delivery, we stringently examine our range on varied parameters to ensure their flawlessness. We also offer these products in customized range and at reasonable market prices. Being a customer oriented enterprise, all our efforts directly aims at maximizing satisfaction of the clients. A team of interactive professionals stay in touch with the patrons on regular basis to understand their exact requirement and afterwards manufacture the offered products, accordingly. To regulate the process of financial dealings, we accept payments through varied simple modes such as cash, cheque, credit card and demand draft. Owing to all these attributes, we have been able to win the faith of numerous patrons in the major markets of Australia, New Zealand, Indian Subcontinent, Caribbean, East/Middle Africa, North Africa, South/West Africa, East Europe, East Asia and many more to name.